What are the dates of the Penn State Washington Program sessions? Are all Penn State students eligible to participate in the Penn State Washington Program? The Penn State Washington Program staff considers students of all majors in its selection process. However, the program is limited to juniors and seniors because most Washington organizations do not accept internship applications from freshmen and sophomores. Students must be juniors or seniors during the semester that they plan to spend in Washington (or rising juniors and seniors for the summer sessions). Can students submit an application if they are graduating before their targeted Washington Program session? No. The Penn State Washington Program only accepts applicants who will be current Penn State students at the time of their targeted Penn State Washington Program session. Does the Penn State Washington Program guarantee students an internship? Utilizing a Washington-area professional network that the program staff has been building since 1995, the Penn State Washington Program guarantees selected students an internship role related to their professional field of interest. The scope of a student’s targeted professional field is determined during the application and interview processes. The Penn State Washington Program does not guarantee students internship roles at specific organizations because hiring decisions are made internally within each organization. How does the internship placement process work? 1. Students can rely on the internship coordinator to seek out their internship (the choice of most students). 2. Students can collaborate with the internship coordinator on the internship search. 3. Students can conduct their internship searches independently without the aid of the coordinator. After students sign contracts committing them to participate in the Washington Program for a particular semester, the program’s internship coordinator tailors the internship search to a student’s particular interests in the months prior to their arrival. The coordinator typically applies on a student’s behalf to about 4 or 5 organizations at a given time, adjusting the application strategy based on a student’s qualifications as well as the conditions of the Washington internship market. Some students are hired very early in the process, while others may not receive word about a job until shortly before arrival in Washington. Since 1995, every single Washington Program student has gotten an internship. 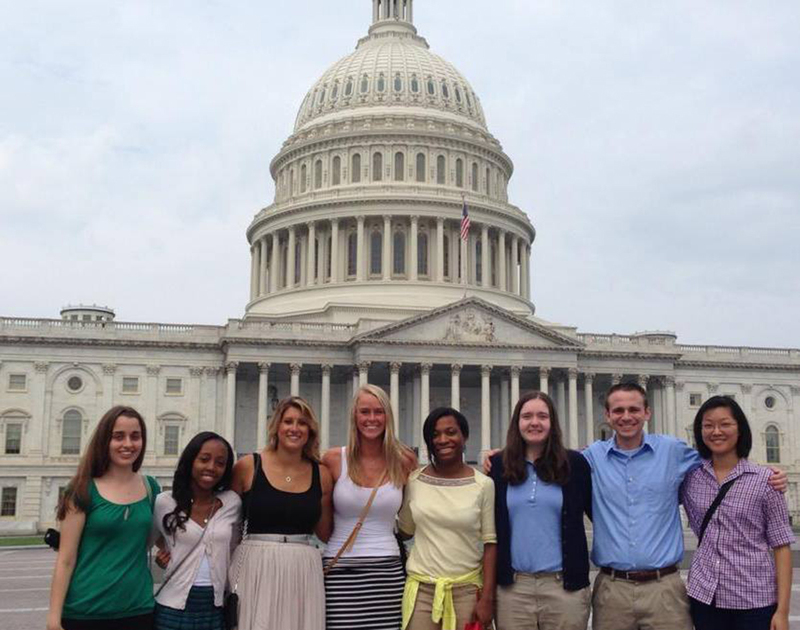 What is the typical work schedule for Washington Program interns? Internship organizations have complete control over determining internship work schedules, but summer session students typically work Monday through Friday. Semester students typically work Monday, Tuesday, Wednesday and Friday, with Thursdays off to take academic courses in the fall. When does the Washington Program offer academic courses? The Penn State Washington Program offers academic courses only during fall semesters. What types of courses are available to Washington Program students? The Washington Program offers 400-level Communications and Political Science courses to students. These courses have no prerequisites. Courses are held in classroom space in Washington, D.C., every Thursday. All courses are taught by Penn State instructors. Students may also supplement their academic courses with online courses. The program coordinator is available to proctor exams for those courses. Are fall semester students required to take any number of academic courses? What are the costs associated with the Washington Program? There is a $500 program fee (beginning in Spring 2019) and students are responsible for covering the cost of their academic credits, housing, course textbooks (fall semester only), and personal costs such as food and commuting costs. Are students required to receive academic credit for their internships? No, but some organizations may require students to take at least one internship credit in order to comply with labor laws if no other form of compensation is made available. Are students required to use the Washington-area housing provided by the program? No. Students with close friends or relatives near the Washington area often opt to live with them as a cost-saving measure. Students who choose to find their own housing cannot be included in the Washington Program housing at a later date after shopping around. How much does Washington Program housing cost? Housing costs are renegotiated each year in order to secure the most competitive possible rate for the Washington temporary housing market. The cost of each furnished, two-bedroom apartment is split between four student residents. Students will be informed of their particular session’s total housing costs before formally committing to the Washington Program. How are students billed for the Washington Program’s associated costs? Penn State will bill students’ bursar accounts for Washington Program housing charges approximately two weeks after the program’s move-in date. The housing costs will be charged in a lump sum, not a monthly rent payment. Do Washington Program students pay in-state or out-of-state tuition? All Washington Program students pay the same tuition rates that they would pay at University Park. In-state students pay in-state tuition rates, and out-of-state students pay out-of-state rates. Most internships in the Washington area are unpaid and the internship coordinator does not use compensation as a criterion in student internship searches. Some students may receive small stipends for their work, but students should not expect them. Are students able to work part time outside of their internships to earn extra money? Yes. Past Washington Program students have secured part-time work outside of their internship roles to generate income. Are all applicants accepted to participate in the Penn State Washington Program? How are candidates evaluated and selected? The Washington Program staff takes a “big picture” approach when evaluating applicants. We assess academic performance, past work experience, ability to function in a professional environment, writing skills, and involvement in campus activities. We also determine whether or not the Washington area provides sufficient internship opportunities in a student’s field of interest. Like any city, Washington provides richer opportunities in some industries than others. How many students are accepted for each session? Rather than target a specific number of students, the Penn State Washington Program seeks to accept as many students as we can whom we feel can take greatest advantage of the opportunity. I'm interested in the Penn State Washington Program, but I want to keep my options open. Is it possible to apply for internships in other cities after committing to the Washington Program? No, but thanks to our large professional network and internship placement guarantee, shopping around won't be necessary. If selected to participate in the Penn State Washington Program, you will be asked to sign an acceptance memorandum that formally commits you to our spring, summer or fall semester session. Because of the trust that we have built up among organizations in the Washington area, each internship application that our staff submits represents our endorsement of your skills, professionalism and maturity. Our endorsement of a student who withdraws from the program at a later date has the potential to erode that trust and damage our longstanding professional relationships. Therefore we cannot conduct an internship search on your behalf without a signed acceptance memorandum demonstrating your full commitment to the Washington Program. Where should I submit my completed application? Please submit all completed online applications through the application page portal by the specified deadline. All letters of recommendation letters of recommendation must be submitted by the people writing the letters by the specified deadline. Who is Stanley E. Degler? The program's benefactor and namesake, Stanley E. Degler, earned his bachelor's degree in journalism from Penn State in 1951 and made his mark in the nation's capitol during a career that spanned more than five decades and set a standard for generations of successors to emulate. He started a one-man news bureau serving newspapers in Pennsylvania and later spend 33 years with the Bureau of National Affairs (BNA). The news bureau for provided news for select audiences, and Degler covered the Department of Defense, environmental issues, transportation agencies, the space program and a variety of other issues. He rose to executive editor, in charge of all BNA publications in the 1980s and later became senior vice president. He endowed the Stanley E. Degler Washington Program with a $1 million gift to Penn State in 2016. Are you a program alumnus?